Although I installed a jAlbum gallery quite some time ago, only now am I getting ready to really put it through its paces. “Atelier – a studio or workshop, esp. one used by an artist” – Artist? Oh, well, I will use the term anyway. Here is an actual glimpse of my “atelier”, of course, the real workplace is inside that black box on the right, my computer. And my tools are a collection of software programs. In this article I will tell you a little about how I import, manage, and organize photos, a bit about “café art” post-processing and some of the tools, and lastly about presentation and sharing of the images. My AutoPlay is set to start the import process when the camera is connected and turned on. Over time I have collected a ton of programs that, either as their prime task, or as an added feature, provide photo management operations. 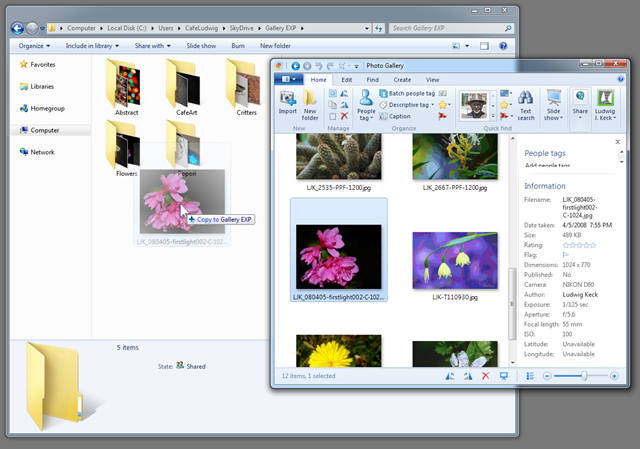 The program I settled on for that task is Windows Live Photo Gallery. Photo Gallery is what I use to do the importing. In fact, this is my go-to program for most photo organizing and managing tasks. The default setting for most programs is to use “My Pictures” as the location and that is what I use. The import routine creates a new folder with the date when the photos were created as the name. That is already a giant step to keeping photos organized. Right after import, Photo Gallery opens. I rename all the photos in the new folder to replace the “DSC_” prefix, that my camera insists on providing, with my initials. This is a two-second operation, see How do I replace the DSC prefix on my photo file names? Then I select all the photos in the new folder, right-click, and open Properties. I add some “boiler-plate” tags, and fill in the Authors and Copyright fields. Most of the specific tagging I do in Photo Gallery, as well as assigning titles, “Caption” as PG calls them. My photos are now organized. In Photo Gallery I can find them by folder location – or by the date they were taken. But most importantly, I can find photos by tags. Some photographers keep a careful system of tags, but I don’t make a project out of it. Occasionally I discover that I have assigned similar tags like “Athens” and “Athens GA”. I have not visited Greece, so it was easy to select all “Athens” photos, assign the “Athens GA” tag to them and then delete the “Athens” tag. Finding photos by date or tag is easy. It does not matter where on my computer the photos are, and indeed they will be in different locations. To keep the “My Pictures” folder from getting too messy, I periodically move older folders to an “archive” location on another drive. There the folders are in tear and quarter sub-folders. That’s pretty much it for organizing and managing, but I must add one note: Other photo managing programs see the same file structure, hence in Picasa, for instance, the organization looks exactly the same. Editing or post-processing is what you do to the photos after they are taken. Some cameras provide editing tools. The only one such camera tool I use regularly is “delete”. I prefer to do the editing in my computer when I can see the images on a large screen. A bit of touch-up can benefit just about every photo. This article will not go into enhancing photos by adjusting the exposure, doing some judicious cropping, retouching and other “tweaks” to bring out the best in pictures. This is about “café art”. Actually there is a bit more to café art: It provides a lot of fun in manipulating photos and creating totally new images. Photos that otherwise are suitable only for the “recycle bin” are often my best sources or “substrates”. On occasion I will take some pictures with the specific intent of manipulating them in a specific way. I did so for this article. Most photo editing programs, as well as some unexpected applications, provide some “art effects”. Windows Live Photo Gallery is somewhat of an exception, it only offers some recoloring effects, unless you count some of the color or exposure adjustments. Picasa provides a richer selection. I often use the “Pencil Sketch”, “HDR-ish” and “Neon” tools. These Picasa tools are simple to use and provide a nice range of the effects. A neat set of tools is provided in several of the Microsoft Office 2010 programs. I often use Word 2010 for its “Artistic Effects” in the “Picture Tools” ribbon. There are some delightful tools. These programs are not intended as photo editors and getting the pictures in and out is not as easy as with the photo apps, but some effects are just not available elsewhere. Another tool I like is FastStone Image Viewer, it has a couple of nice effects that I use often, “Sketch” and “Oil Painting” and offers a rich selection of “Frame Masks”. You saw one of the masks at the beginning of this post. There are many other art tools and I use several. Photo editors also include extensive manipulation tools. My long-time favorite is Corel PaintShop. This is a professional strength photo editor. Others are Adobe Photoshop and Gimp. Photos, and especially “art”, is more satisfying when it is shared and presented to others for their pleasure. In this time of the Web, sharing is online. You are seeing these images on the Internet. There are many photo sharing sites and many other places on the Web where pictures can be viewed. I use several, the menu at the top of this page takes you to most of them. The sharing service I like the best is not even a good photo sharing site – although it was a couple of years ago: SkyDrive. Microsoft is trying to make SkyDrive the ubiquitous sharing tool for everything, everywhere, and everyone. For sharing photos it is not in the league of Flickr, Picasaweb, Shutterfly, and the many other sites specifically designed for sharing pictures. The reason is that it is much more private, it does not provide an easy entry “front door”. It is more like a “private club” than a “public house”. 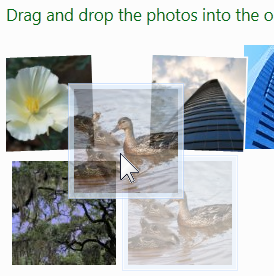 Once you construct a “Grand Entrance” to your SkyDrive albums, you have a great way for sharing photos. I like to use blogs as the “front end”. You can see this at Gallery Ludwig, and specifically for “café art” at Silver Canvas. SkyDrive is easy to use. 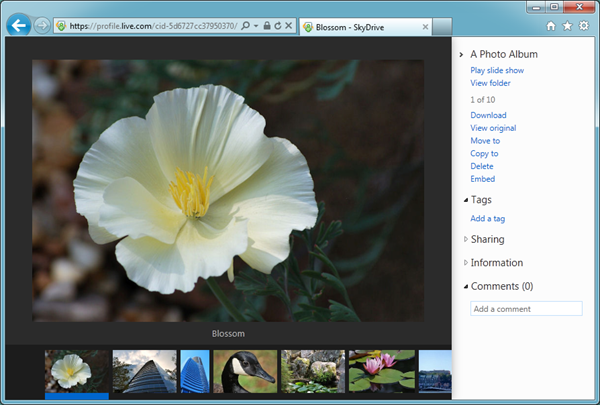 Uploading to SkyDrive can be done right from Live Photo Gallery, directly in a browser, “skydrive.cm”, and most recently, with a SkyDrive desktop app. Here are some quick demonstrations. Since I use Live Photo Gallery for organizing and enhancing photos already, using it to upload to SkyDrive is just a click away. 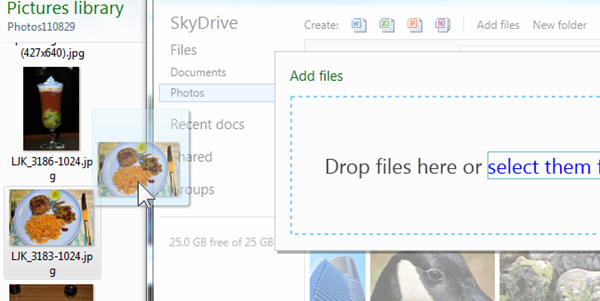 The process is simple enough: Select the photos you want to upload, click SkyDrive and the process is underway. 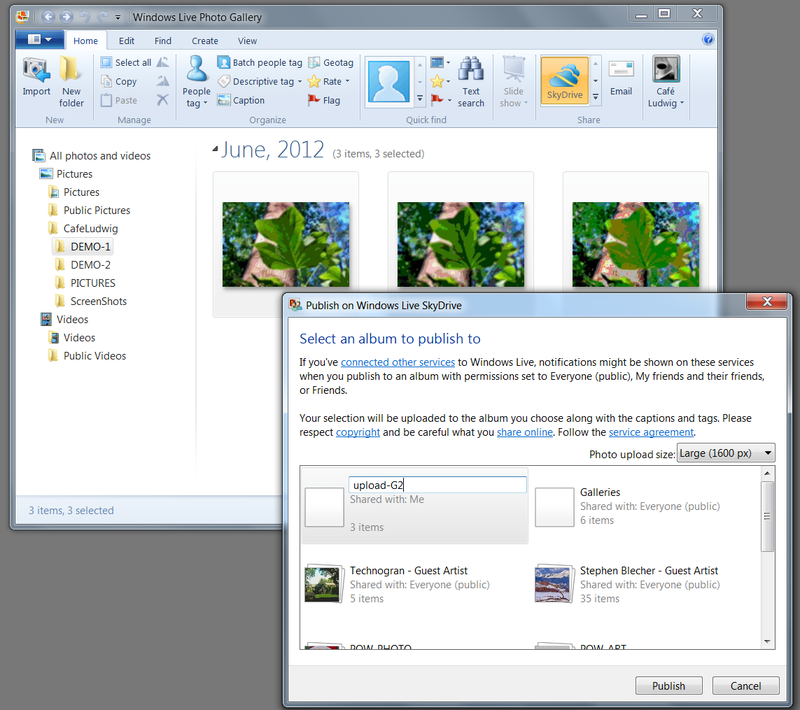 A dialog opens showing your SkyDrive albums along with an option to create a new album. One small downside: You cannot upload to sub-folders this way. But that is easily fixed by creating a temporary album, uploading, then moving the photos to the sub-folder where they should be. 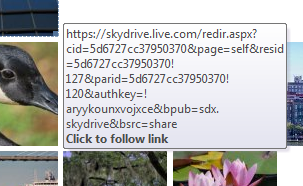 Moving the photos is done at “skydrive.com”, that is, online using your browser. It is quick and easy as you can see in the two illustrations here. One other note: By default the photos will be resized to 1600 pixels (max dimension). There are other options, 600 pixels and “Original”, whatever size the photos are. 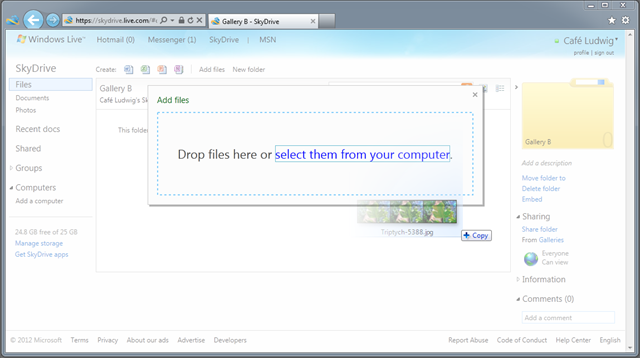 The SkyDrive desktop app replicates your SkyDrive on your computer and automatically keeps the contents of SkyDrive in synch with the local folder. The local folder is just like any other folder and you manage it with Windows Explorer. Using the desktop app is just a matter of dragging photos to the folder or sub-folder. The size and other properties of the files are not affected. Note of caution: Be careful that you copy the photos and not move them, unless that is where you wish to keep them. 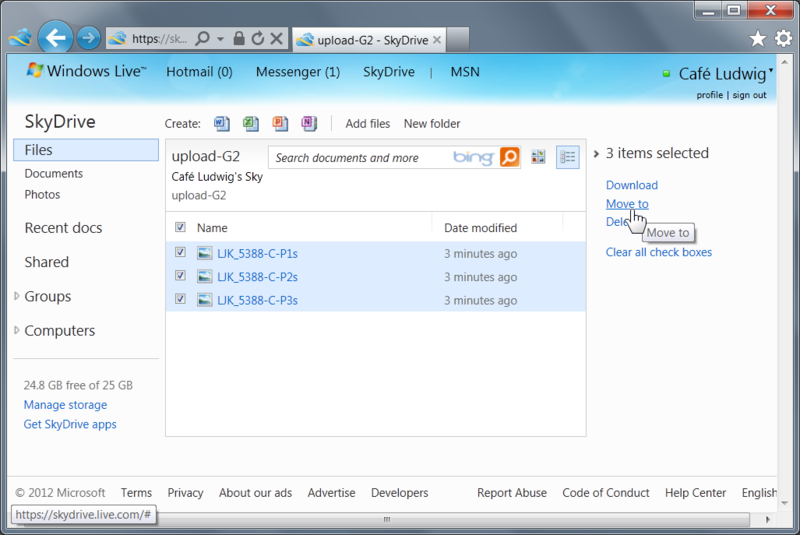 Almost as easy as the two methods discussed is uploading to SkyDrive when you are signed in using your browser. You navigate to the folder and click Add files. A window opens with a message “Drop files here…” (see illustration, you must have Silverlight installed for this option). Just drag the photos over into this window. The upload process starts right away. Of course, there is a catch. 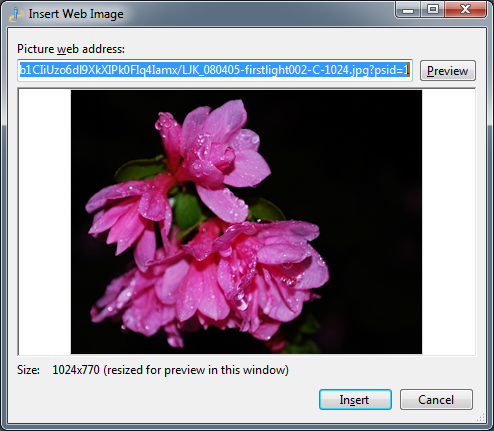 At the bottom of the dialog is a checkbox and the text “Resize photos to 2048 px”. The checkbox is checked indicating that your photos are already being resized. 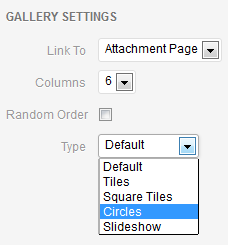 If you want the photos to be uploaded in their original size, click the checkbox to uncheck it. There will be another dialog that says “Change photo size”. Click the Yes button. The upload will be restarted and your photos will be uploaded in their full size. 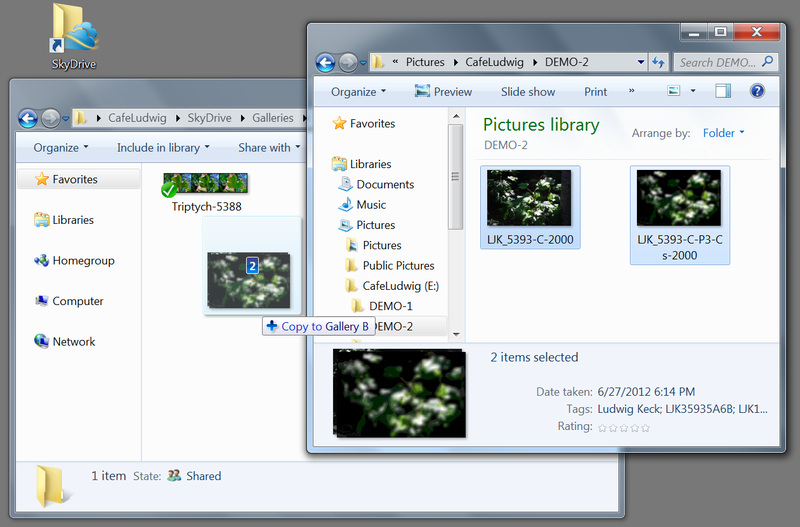 Uploading by way of the online SkyDrive features was illustrated above with a file named “Triptych-5388.jpg”. This is indeed a rather large file and cannot be easily viewed in SkyDrive. You can see in the illustration that the size is 12000 x 2800 pixels. Larger than your monitor, I bet. Here is “Leaves – triptych” presented in a neat Microsoft service called Zoom.It, just click the image. 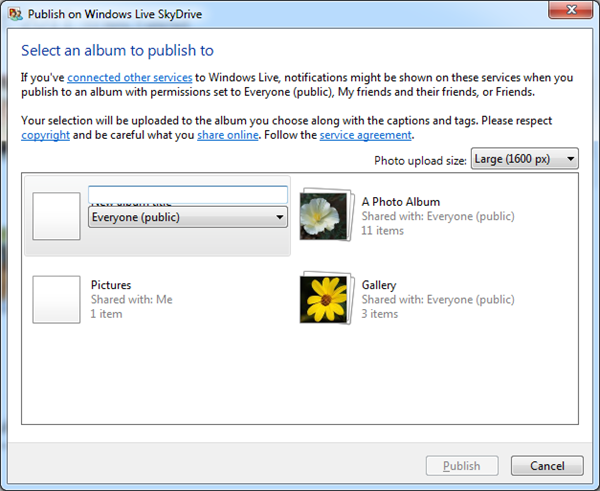 Windows Live SkyDrive offers a lot of storage for photos and documents. Recent improvements make organizing albums and folders much easier. 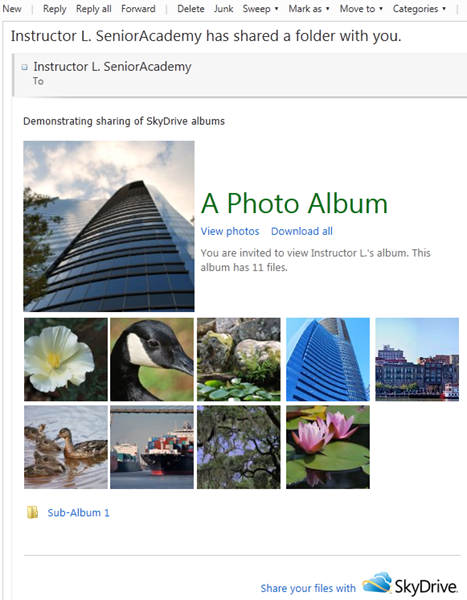 SkyDrive is not designed to be a photo sharing service, but with some care you can present your gallery in a pleasant manner and make it fun to visit. Here are some tips for making your gallery a nicer experience for your visitors. 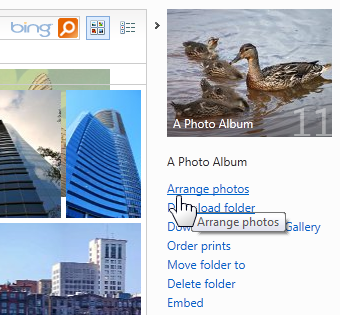 You can have folders with sub-folders in SkyDrive, so one album page can lead to others. Recent changes now allow “root location” folders to be moved to any other folder or sub-folder. This makes organizing and re-organizing your gallery quite easy. Right-click on a folder tile to get a drop-down menu with various options. One available choice is Move to. This allows you to move the folder to any other folder. The order of sub-folders in a folder is not under user control, however the photos inside an album can be rearranged. In the right pane, click Arrange photos to go to the “Arrange photos” page. If you have Silverlight installed, this is just a drag-and-drop procedure. The alternate procedure is just a little more time-consuming. Each thumbnail is shown with a text box below showing a number that indicates the current order. Just replace that number with the new location order. When a thumbnail in an album is clicked, it will be shown large. The information pane on the right can be turned off with a click on the “Collapse” chevron. The right pane also offers a “Play slide show” option. All this can make your album and entire gallery a nice experience for visitors. 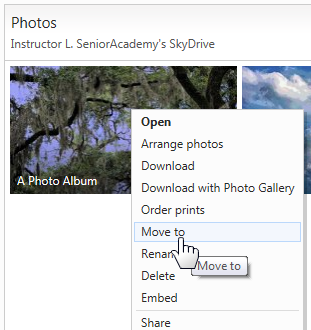 There are two easy ways of uploading photos to your SkyDrive albums. You can open the “Add files” dialog from folder view. Again there is a drag-and-drop option. Just drag photos from your computer to the “Add files” panel. They will start uploading as soon as you release the mouse button. Here too, there is a manual method that opens a standard “Open” dialog where you can navigate through your libraries and folders and select the photos to upload. The second way of uploading is directly from Live Photo Gallery. There is a serious limitation in this method. 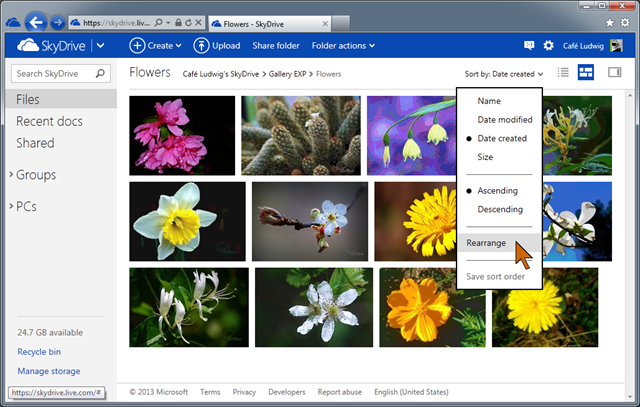 You can upload photos only to albums in the root of your SkyDrive. You cannot upload to subfolders. The procedure is simple. 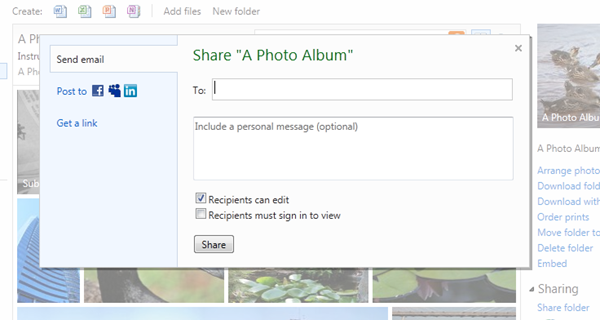 Select the photos and click the SkyDrive icon in the Share group on the Home ribbon. 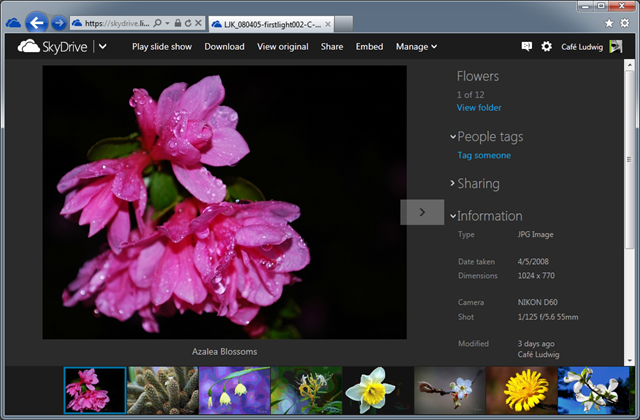 Photo Gallery opens a dialog that connects to your SkyDrive. You have to sign in if you are not signed in to Photo Gallery. The upload dialog shows your albums so you can select the one to upload to. You may even see other albums that you are permitted to upload to. You can also create a new album right in this dialog. Another option is to specify the size of your photos. If they are larger than this specified size, the photos will be scaled down to this size. The default is 1600 pixels on the larger dimension. For most uses this is just fine. You can select “Original” in this dialog to upload photos in their full size. There are uses for that, but that is the scope of this article. Now, unfortunately, comes the part that is a “downer”. 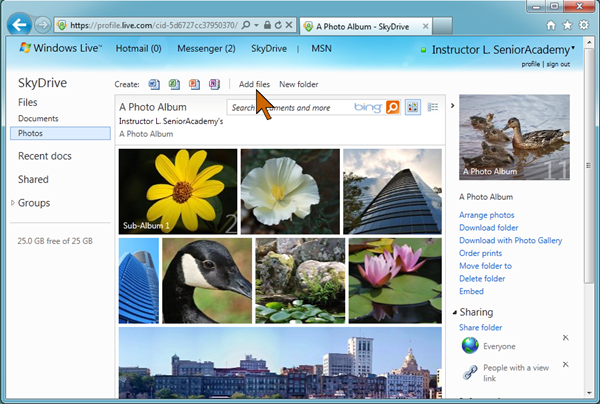 There is no short, easy to remember, web address for SkyDrive albums. One way to inform your friends of the album and provide them with a link is with an email. This can be done right from the SkyDrive album. Click “Share folder” under the Share group in the information panel on the right. As you can see in the illustration, there are a number of options. Besides sharing with an email you can post to Facebook and other social networks and to get links that you can distribute separately. For the email option just enter the recipients’ email addresses. You can include a message in the email. Note that the “Recipient can edit” check box is already checked. Normally you want to uncheck that. You can also require that the recipients sign in to their Windows Live account to view your album. Not something you want to require when just casually sharing photos. The recipients get a pretty email that looks like the illustration here (the recipients address has been removed). The email contains a “View photos” link that takes the visitor right to the album in folder view with the pretty tiles of the photos. In fact, clicking on any thumbnail in the email opens the browser right to that photo in large view. You can copy the URL of the photos or the folder. These are very long and ugly, as you can see in the illustration. You definitely would not want to type out such a link. Better to stick to the pretty email. If the album is public, that is shared with Everyone, the email can even be forwarded to others. My suggestion is this: Set up one folder as your “gallery”, organize you photos in subfolders. Share your gallery with “Everyone” if you want public access. Private albums should go into a separate folder or folders with more restrictive sharing. Note: You can share individual photos. However the visitor will have access to other publicly shared photos and albums. Using Live Writer as your blogging tool offers a number of ways to show album links. Above is just one example.